Star Wars hit 1977 like a pop culture atom bomb. Audiences couldn’t get enough of the strange worlds and the stirring blend of science fiction and fantasy that sprang from the imagination of George Lucas. He took the template of a damsel in distress and turned her into an independent, self-assured rebel. He made a farm boy into a hero and a lone smuggler into a freedom fighter. A black-caped figure became the most infamous movie villain of all time, but who also found redemption. As innovative as those components were, they were all inspired by films that Lucas grew up with. His imagination is like a cinematic blender of style, visuals, and tone, masterfully taking elements of the familiar and crafting them into something that feels fresh. Here are a few of the cinematic influences on the Star Wars saga. During the making of American Graffiti, George Lucas and producer Gary Kurtz became enamored with the idea of taking a different kind of nostalgia trip. In his youth, Lucas watched a TV series called Adventure Theater featuring Flash Gordon Conquers the Universe. However, times change and the movies of the 1970’s had become serious and bleak. Lucas and Kurtz wondered what it would be like to remake Flash Gordon and return film making to the fun and adventure of a simpler time. Lucas decided to make his own space opera, and it would stand as an homage to Flash Gordon in form as well as function. The wipe transitions so prevalent in Flash Gordon films were incorporated into the saga . 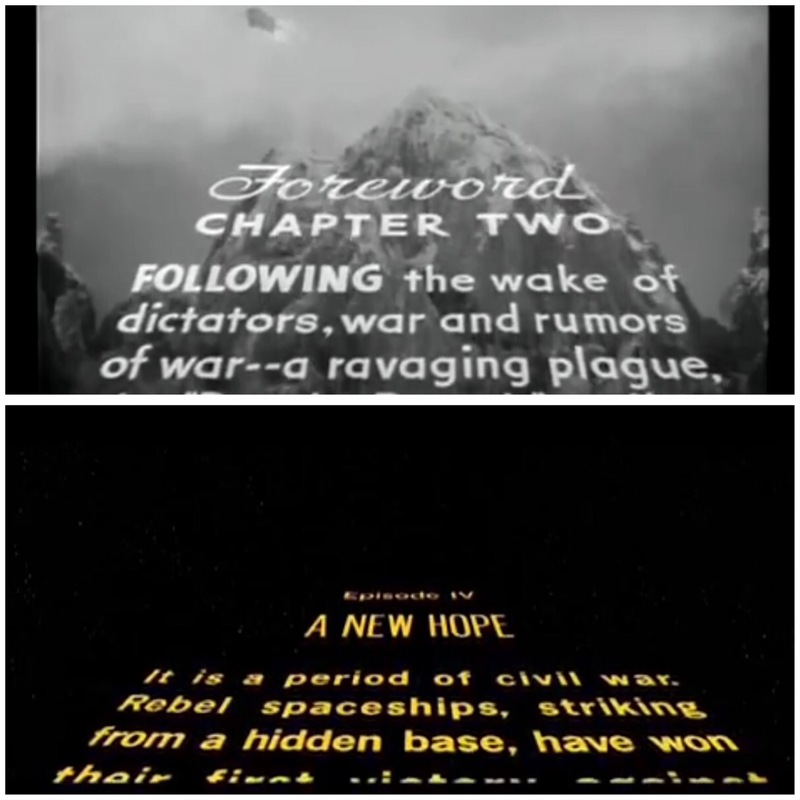 Each chapter of Flash Gordon begins with an expositional crawl, so it was adopted for the opening of each episode of Star Wars. But the similarities do not end there. 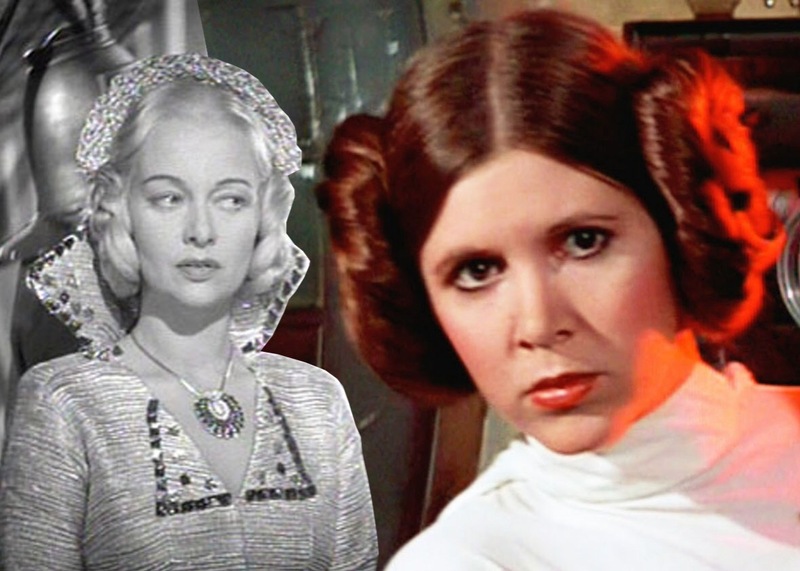 Princess Leia’s “cinnamon bun” hairstyle bears a striking resemblance to the hairstyle of Queen Fria. Planets in the Flash Gordon serials were usually comprised of one geographical feature: jungle, ice, a floating city. This became a signature concept for planets like Hoth, Bespin, and Endor in the Star Wars galaxy. Serialized storytelling was another inspiration Lucas took from Flash Gordon. Serials are episodic in nature. They deliver conveniently packaged adventure for mass consumption and always end on a cliffhanger which promises more adventures to come. Therefore, the story is never truly complete. Star Wars suggests a saga that is multi-generational and never ending, as big as the galaxy it occupies. Japanese filmmaker Akira Kurosawa was one of the most prolific and influential directors of the 20th Century. His body of work spans 57 years and includes 30 films. His work has been studied and incorporated into the films of many American directors, George Lucas in particular. 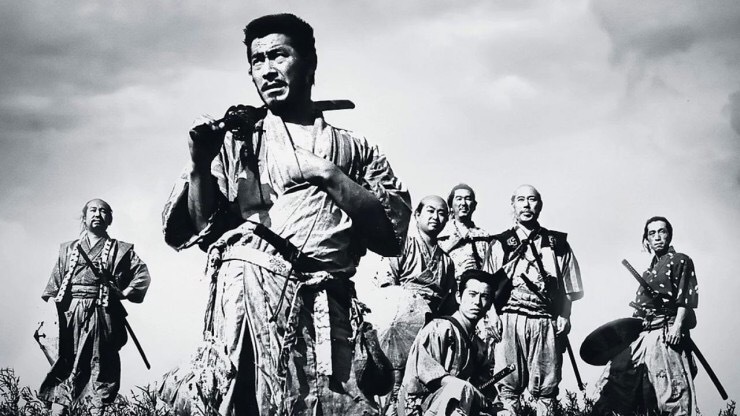 Kurosawa’ Seven Samurai is well known as the source of inspiration for the great American Western The Magnificent Seven, but it was also a huge influence on Star Wars, both past and present iterations. It is the story of a ragged band of samurai warriors who help a village of farmers fight a gang of criminals. The Clone Wars TV series paid homage to this movie in the episode “The Bounty Hunters,” but the samurai were also early prototypes for the Jedi. The movie is full of moments that Star Wars has recycled in one form or another. The samurai master Kambei Shimada is frequently shown running his hand over his head in contemplation. Yoda performs the same gesture in Revenge of the Sith. In one scene the gang of criminals crests the top of a hill, which turns up again as the Trade Federation tanks appear over the rolling hills of Naboo in The Phantom Menace. The visual design of Star Wars references Seven Samurai in everything from the use of wipes (just as Flash Gordon before it) and even Darth Vader’s helmet, which is very samurai-like. The leader of the criminal gang in Seven Samurai is implied to have been a former samurai, which sounds an awful lot like Vader’s backstory. However, if there is one Kurosawa movie that had the most influence on Star Wars, it would have to be The Hidden Fortress. The plot unfolds through the eyes of two bickering peasants. Lucas liked this narrative device so much, he wrote the opening of A New Hope from the perspective of the lowly droids. 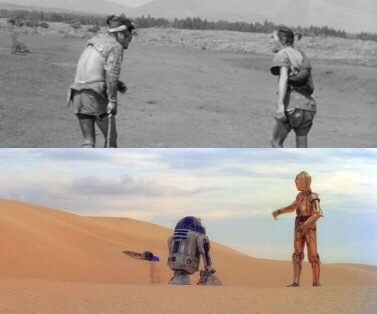 Shots of C-3PO and R2 dwarfed by Tatooine’s vast desert are lifted straight out of The Hidden Fortress which places the peasant protagonists in a similar position against the landscape. The plot of Kurosawa’s movie features an outlaw princess who, with the help of an old rogue warrior, escapes Imperial Forces. Sound familiar? In The Hidden Fortress, Princess Yuki disguises herself as a commoner in order to evade capture similar to how Amidala poses as her own handmaiden in The Phantom Menace or as a bodyguard in Attack of the Clones to throw off assassins. Kurosawa’s princess Yuki was a guiding influence on the character of Leia. Yuki, like Leia, is a damsel definitely not in distress. She can take care of herself in a fight much like the princess from Alderaan or the Queen of Naboo. Although not as prevalent in the narrative themes of Star Wars, other films contributed inspiration in the form of design or editing. The science fiction epic Metropolis was especially influential on concept artist Ralph McQuarrie, who based C-3PO’s design on the look of the female android called Maschinenmensch (German for “robot”). Lucas wanted the face of 3PO to be neutral like the robot in Metropolis because the audience could then project any emotion onto the character as needed. Fritz Lang’s masterpiece continued to inspire Lucas when he returned for the prequel trilogy. 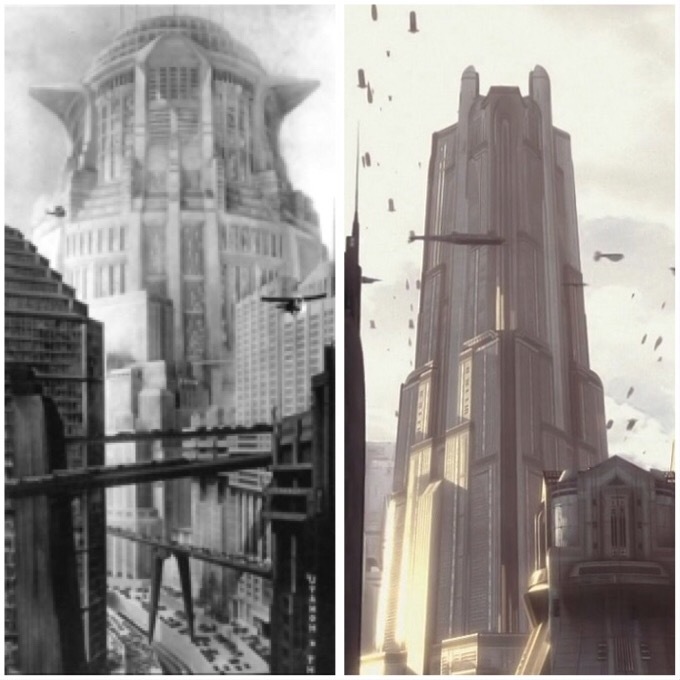 Along with the paintings of McQuarrie, he used the towering, bustling cityscape in Metropolis as inspiration for the city planet of Coruscant. When Lucas was filming A New Hope, he had a specific style in mind for the space battle over the Death Star. He wanted it to look like the footage of World War II dogfights, so he instructed his FX team to watch scenes from the 1955 British film The Dam Busters. Frame for frame, the space battle in A New Hope closely matches many shots from that classic movie. Even some of the lines of dialogue are similar. 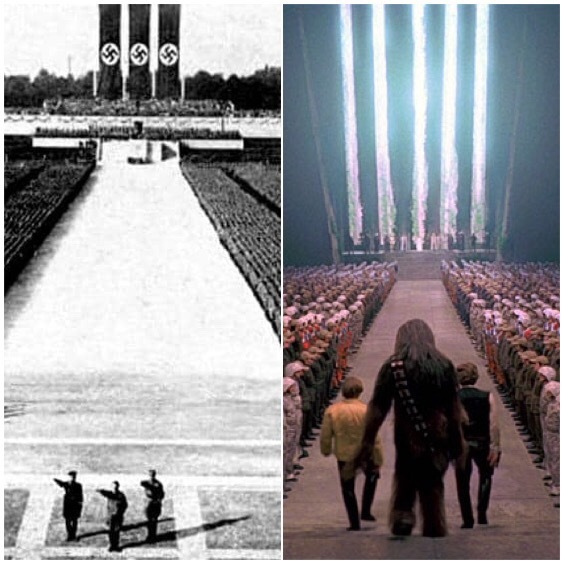 Even though it has been noted over the years, many people would be surprised to know that some of the visual inspiration for Star Wars came from a Nazi propaganda film of the 1930’s. Lucas saw Triumph of the Will while in film school and it had a powerful effect on him. The evil Empire is easily an analogy for the fascist regime of the Third Reich. Nazi soldiers were called stormtroopers. One look at Imperial uniforms and the helmets of Death Star officers suggests they were based on Nazi attire. But the most striking similarity to Riefenstahl’s film did not involve the Empire. It was a scene featuring the Rebel Alliance. The medal ceremony from A New Hope bears an uncanny resemblance to a scene in Triumph of the Will in which Adolph Hitler, Heinrich Himmler, and Viktor Lutze lay a wreath at President Hindenburg’s memorial. In both shots, hundreds of subjects stand at attention in a vast arena. Both feature three individuals standing side by side in a procession. Each scene contains a stage above which are long vertical banners or, in the case of the throne room, windows. Why would Lucas use imagery from a Nazi rally for a gathering of good guys? One possible explanation can be found in the visual clues. Consider the stage and the space above it. In Triumph of the Will, the distance is dominated by banners containing the Nazi emblem. No flags of any kind exist in the throne room – not even the symbol for the Rebel Alliance. Instead, the corresponding space above Princess Leia and the Alliance leadership is open to the outside. Light and vegetation pour through. The Alliance has just won one of its first decisive victory against the Empire, but their ceremony is not a display of power and might. Luke, Han, and Chewie are honored for their bravery and contribution even though they joined the Alliance as outsiders. The ceremony is a celebration of the spirit of cooperation and friendship. Lucas took the iconography of tyranny and re-appropriated it to celebrate freedom. But it is also possible that Lucas wanted to invoke another idea. The Empire rose to power over a galaxy that initially welcomed it. Freedoms were forsaken and democracy died in exchange for order and stability. The Rebel Alliance subscribed to the framework of the Old Republic. But these were the ideals of a system that had allowed fascism to gain a foothold. Those who fought the evil of the Empire would need to be vigilant to keep their fragile liberty alive, or careless indifference would allow the seeds of oppression to flourish again.